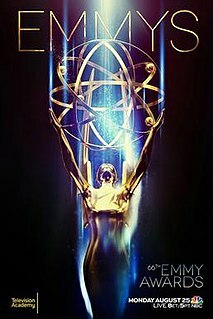 The Primetime Emmy Award for Outstanding Individual Performance in a Variety or Music Program was an annual award given to performers in a variety/music series or specials. The award has been retired; it was last presented in 2008. ^ a b Awarded as "Special Classification – Individuals." ^ In 1995, Dennis Miller was nominated for his HBO talkshow Dennis Miller Live. His nomination was belatedly rescinded after the Academy said it discovered rules do not allow the host of a variety or music series to be nominated for the same program if the host's name is in the title. Sixth place finisher Rosie O'Donnell was named as the replacement nominee. ^ "Miller's Emmy nomination disqualification". The News. Retrieved 18 July 2016. The 52nd Primetime Emmy Awards were held on Sunday, September 10, 2000. The ceremony was hosted by Garry Shandling and was broadcast on ABC. Two networks, Bravo and The WB, received their first major nominations. This remains the only year in which a show from The WB or its descendants received a major nomination. The 54th Primetime Emmy Awards were held on Sunday, September 22, 2002. Nominations were announced July 22, 2002. The ceremony was hosted by Conan O'Brien and was broadcast on NBC. Two networks, FX and VH1, received their first major nominations this year. The program America: A Tribute to Heroes was simulcast on every major network, and therefore, is not designated with one below. The 58th Primetime Emmy Awards were held on Sunday, August 27, 2006 at the Shrine Auditorium in Los Angeles, California on NBC at 8:00 p.m. ET with Conan O'Brien hosting the show. The ceremony attracted 16.2 million viewers, 2½ million fewer than the previous year's ceremony, but still the ratings winner for the week. The Discovery Channel received its first major nomination this year. The 59th Primetime Emmy Awards were held on Sunday, September 16, 2007, honoring the best in U.S. prime time television programming at the Shrine Auditorium in Los Angeles, California. The ceremony was televised live on Fox at 8:00 p.m. EDT for the first time in high definition (on tape delay three hours later on the West Coast of the United States at 8:00 p.m. It was also the most recent Primetime Emmy Awards ceremony to be held at the Shrine Auditorium, as it was then relocated to the Nokia Theater from the following year. The ceremony was hosted by Ryan Seacrest. The 60th Primetime Emmy Awards were held on Sunday, September 21, 2008, at the newly opened Nokia Theatre in Los Angeles, California to honor the best in U.S. prime time television. The ceremony was hosted by Tom Bergeron, Heidi Klum, Howie Mandel, Jeff Probst, and Ryan Seacrest and televised in the United States on ABC. 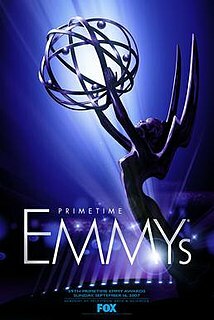 The 67th Primetime Emmy Awards honored the best in U.S. prime time television programming from June 1, 2014 until May 31, 2015, as chosen by the Academy of Television Arts & Sciences. The ceremony was held on Sunday, September 20, 2015 at the Microsoft Theater in Downtown Los Angeles, California, and was broadcast in the U.S. by Fox. Andy Samberg hosted the show for the first time. The nominations were announced on July 16, 2015.